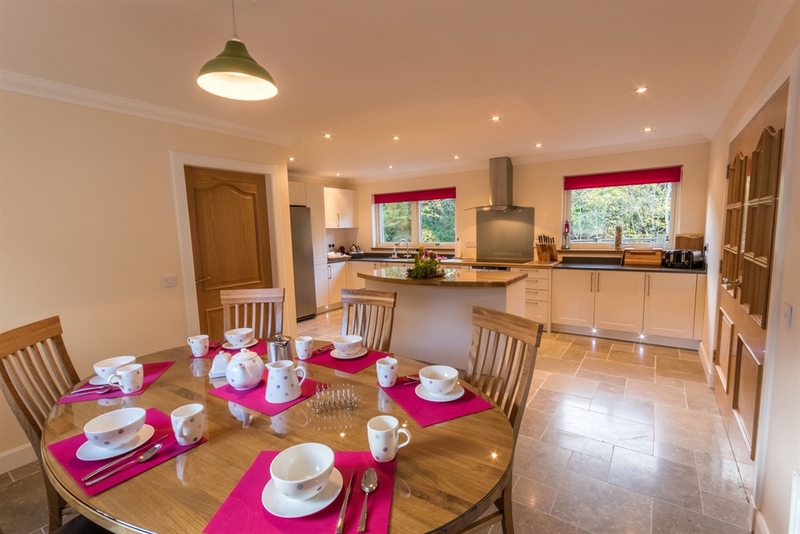 Tursachan is a fabulous, 4 bedroom house sleeping 8/9 with a HOT TUB and is incredibly spacious and airy. It is also DOG FRIENDLY and offers 2 night breaks. 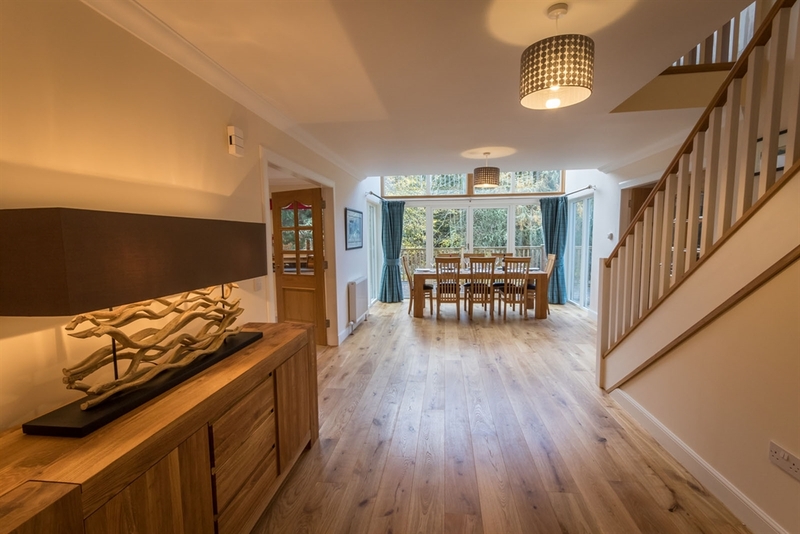 All of the furniture and finishings are of an incredibly high standard and the house is extremely well equipped. Every room has the ‘wow’ factor and is stylish and luxurious. 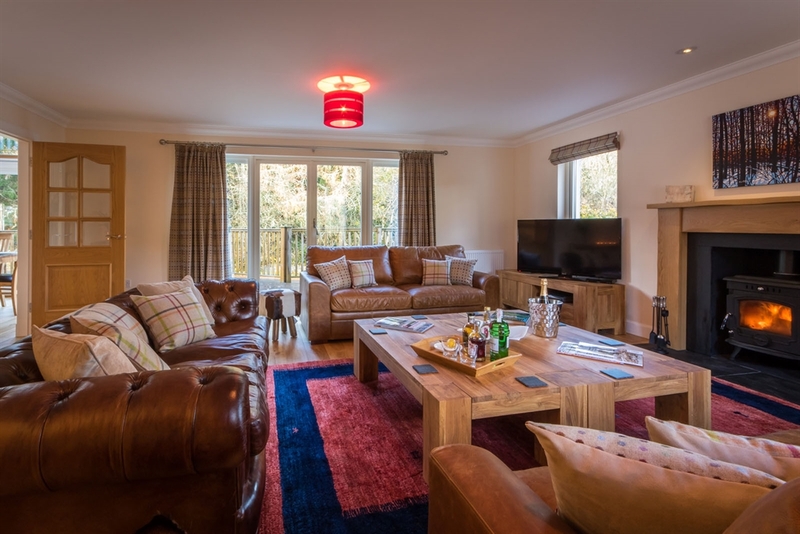 The living room has a wood burning stove, 3 large leather sofas, 50” flat screen TV with Sky, triple aspect with patio doors on 2 sides that lead out on to extensive decking. The dining hall has a glass gable end and galleried landing above and the natural light floods the entire area. The large dining/kitchen has a beautiful oval oak dining table and an island with breakfast bar and a stunning natural stone floor. An induction hob, electric oven and a combi microwave oven will make cooking a joy and the American style fridge freezer has an ice maker and chilled water dispenser. Designer bone china dinner service, glasses and cutlery, extensive selection of pans and cookware, quality knives and every utensil you could think of are also provided. 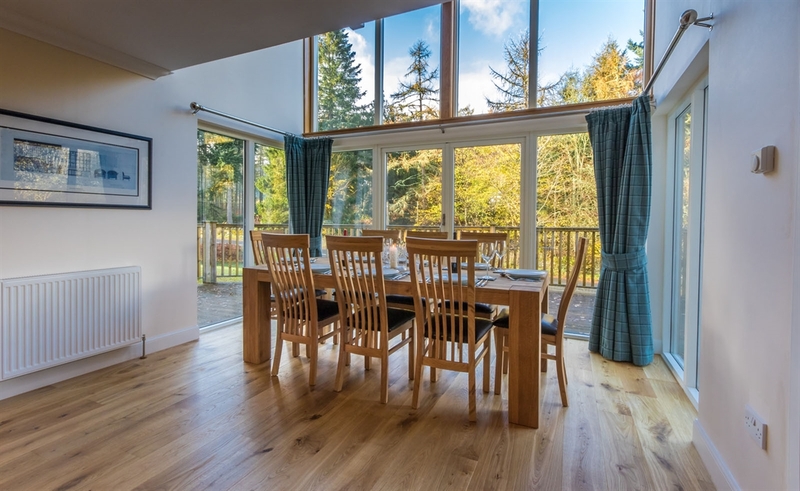 Whether you want a formal dinner party or relaxed family dining, it is all possible at Tursachan. There is also a utility room with washing machine and tumble dryer, off the kitchen which then leads to the integral garage which can be used for bike storage etc. 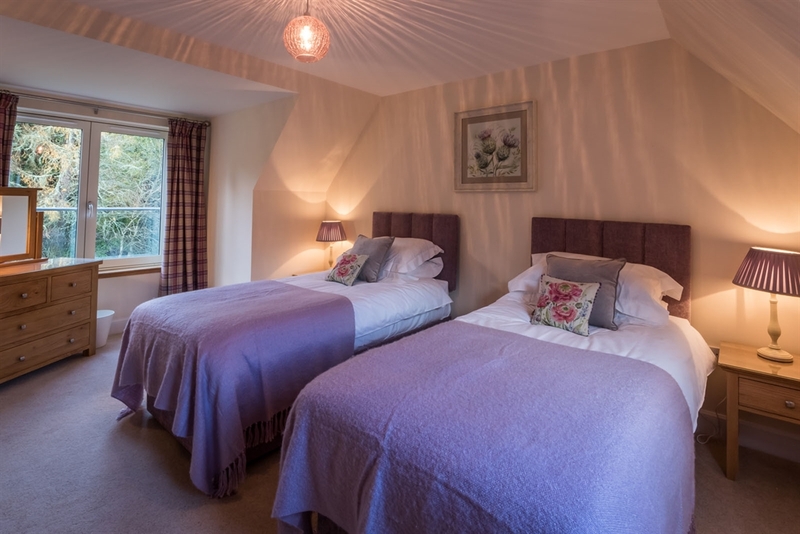 There are three en-suite bedrooms upstairs, two with king size beds and one with the zip and link beds giving the option of twin or super king beds. 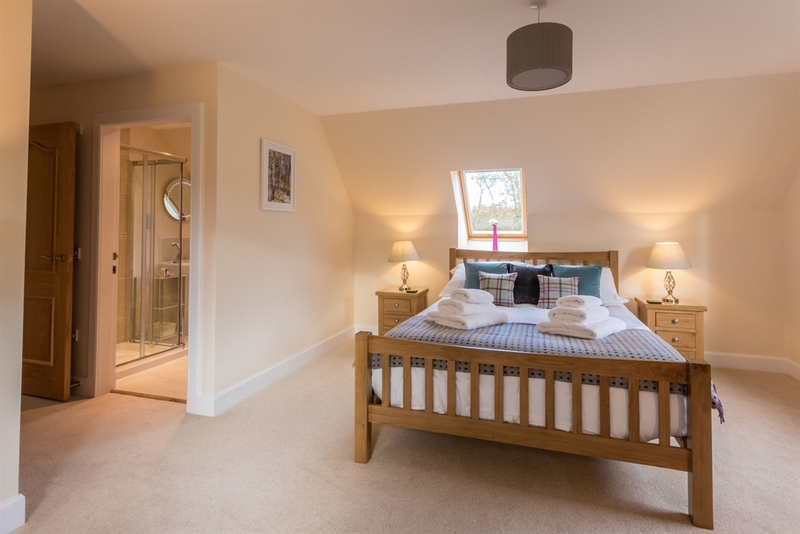 The fourth bedroom is located downstairs and also has zip and link beds to give flexibility. 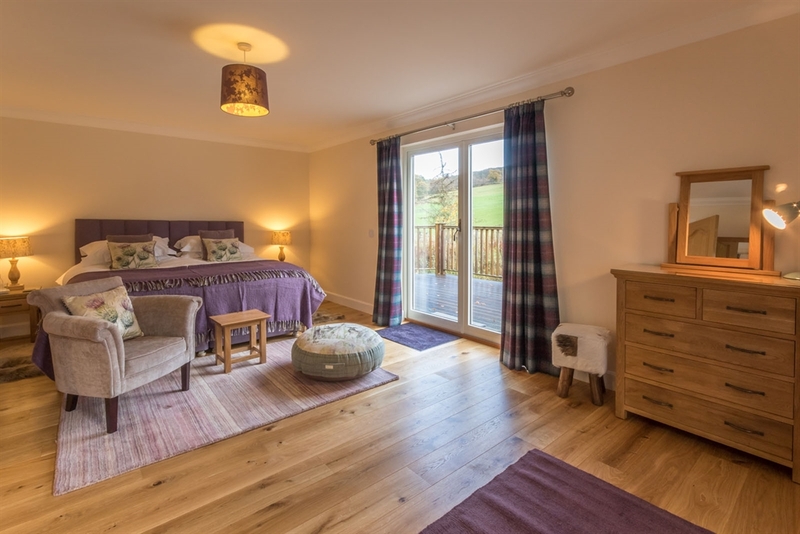 This huge bedroom has large patio doors opening out on to the decking also providing wonderful views of the garden and hills beyond. 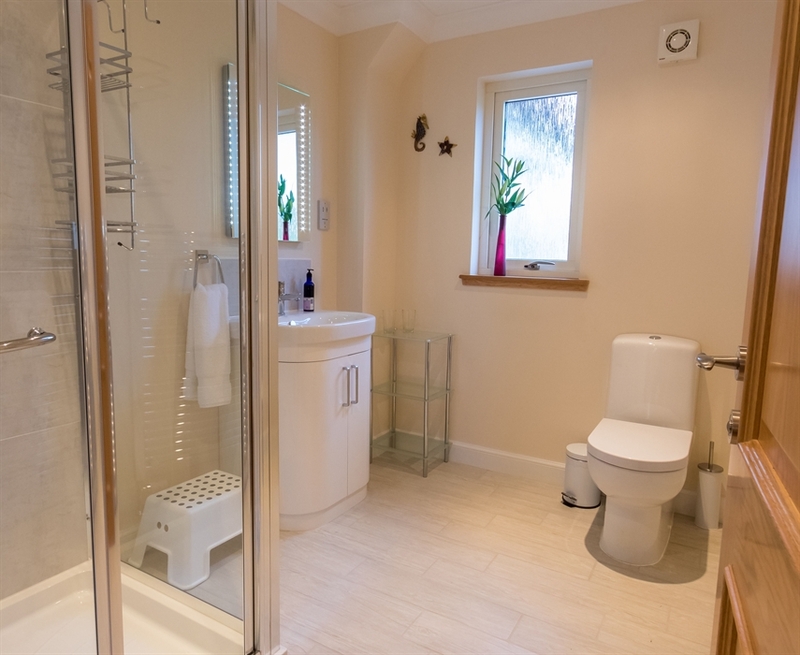 There is a large shower room next to this bedroom. This popular area of Highland Perthshire is a mecca for cyclists and with this in mind, as well as providing secure storage for bikes in the garage, there is also a pressure washer that guests are welcome to use to clean their bikes and kit. The garage can also be used for other things such as golf clubs, canoes etc.